Gaelikaa mentioned something about going shopping for a new one. I would have gone with her so that together we might enjoy a girlie giggle as we browsed and made our purchases. Now I want a new handbag! Actually I seldom carry one these days, but I do love them….and… Shoes! This getting old lark means that some of the shoes I like are but a memory now. The cheek of someone, telling me that I should be wearing laced or buckled shoes. Next they will be putting me back in stays! I suppose I should be thankful it is not a straight jacket they suggest. George, hide that last bit from Elly in case she gets ideas! It made me think of all the handbags that are in my cupboard. I am trying to remember when I last purchased one….. Quite a few years ago, I think. I was in Belfast. Wandering, window shopping and browsing! It was a bright autumn morning and I was enjoying the sunshine warming my bones, and that was part of the reason I spent so long looking in the window of a leather goods shop. Handbags; it was mainly handbags on display. One section was of up to the minute high fashion – sure to be out of date and abandoned the very next week. Then there were bags covered with beads or feathers, “Sure I could make them!” I thought, but I could see why they were asking such a price. Proper beading takes time…. and plenty of it. It is a very precise art. Next I noticed a display with bags, in the shape of gift bags covered in fabrics and the greatest excuse for fabric roses you ever saw. Now if Elly had come home from Primary school and said she made them I would have been proud and delighted to display the finished product up on the shelf with the Irish cottage ( I’ll show you that another day! 😉 ). The roses were very badly made and the bag itself was poorly finished. The price ticket said:- £50. ❗ I didn’t believe it was possible so I went inside for further inspection. Who in their right mind would give £50 for such a poor specimen? I did like the simple shape and took a closer look at how it was put together. Once satisfied, I set it back carefully on the shelf and continued my browsing. There were several leather bags in what I would call classical designs. In fact there were a few I would put to very good use. They too, had a price ticket of £50, good value for real leather I thought. That day I had not set out to look for handbags, so I dragged myself away from temptation. At this stage I was the only customer and there were two sales assistants, one of whom was on the phone. As I drew close to the door, the assistant replaced the telephone and shouted to the other girl “Everything 50% off!” I stopped in my tracks, with my mind working forty to the dozen. I lifted a bag and pretended to be very interested as I listened to the exchange between the sales ladies. Sure enough word had come down from on high that all goods were to be marked down to half price, effective immediately. So as they busied themselves with writing labels and attaching them to the products, I worked my way back to the classic leather bags. Fifty pounds was actually a good price for a leather handbag… but for two, it was not to be missed. You guessed it. I bought two handbags, different styles, but in different colours. One was black and the other was navy. I was working back then so a handbag was a necessity for a girl who was away from home all day. *Large tan holdall/handbag (goes well with my riding boots. Sigh! Will ever get my feet into them again?). Well that is my stash of bags! Not bad since most of them are ten or more years old. I wonder which has my tuppence in it? This entry was posted in Uncategorized on November 10, 2009 by Grannymar. yes, you are eminently qualified to be called the Bag Lady. I love the patchwork bag. The bargain black one far left is nice too. I’m surprised they’ve all lasted so long, Jenny’s bags always have to go sooner or later because however well they’re made a strap falls off or there’s a hole somewhere. A few weeks ago I had the task of sorting through my late M-I-L’s wardrobe for distribution to charity shops etc. I checked the pockets of everything carefully. In one handbag, I found three crisp £10 book tokens enclosed in a greeting card. FINDERS KEEPERS! I whooped with joy! Oh Grannymar. Is that your complete collection of bags? Such self control. I am not getting into how many I have and how much I have spent and how I conceal the cost from my hubby LOL. If you are the bag lady I am definitely your big sister. I do have a beautiful pink soft leather D&G bag purchased on fifth Avenue. I adore it. I hardly use it but I just love to take it out of it’s dust bag and admire it. I bought it five years ago and it still looks grand. Like you I like classic shapes if I am going to spend which I do far too frequently. I think your collection of handbags is beautiful.. I love them because they are not HUGE..
Have you noticed the size of the bags the young girls tote around? What do you think they keep in there that they need so much room? I have a very small bag to take shopping with me. I have only my credit card,comb,lipstick and about $20.00 in cash. What more do I need? My main bag with my entire wallet,including driving license,money,and other necessities is left locked in my trunk (boot). I see young girls on the street carrying larger bags than the one I take away with me for a weekend trip . Again, I wonder what is so important that they carry it with them wherever they go . Sorry about those Irish Pounds, Steph. I did that,too. I had some English Pound bills left after they went to the Pound coin and my bills were useless after the period they gave you to cash the bills in. I missed the boat on that one. A nice display! I have (probably) about 15 purses, but I only carry 3 of them routinely. I hate to change purses! So, I have one for winter, one for summer and one for spring and fall. All the others languish in my closet, except for special occasions, of which tehre are fewer and fewer in my life. Ramana – for the past number of weeks i was the ‘baggy lady’ too, but thankfully with each day I manage to wear neater fitting clothes. Nick – Some time ago Elly came to me with a favourite bag, sad that the lining was worn and torn. I said I would have a think about it. Taking out all the lining, I made a pattern from the pieces. I included a zip pocket like the original and added one for a mobile phone plus another one for cards and a loop for a pen. The fabric I used was a bright pink sample that came from her Granddad (my father). The past the present and the future all in one! Steph – Did you not try to use them… saying how you came to have them? Nancy – I have managed to overnight with all I needed, using only the tan bag on the right, it is large and very soft and light. I worry about those young girls carrying large heavy bags over one shoulder with all but the kitchen sink in them. They are storing up big trouble for the future with backache. 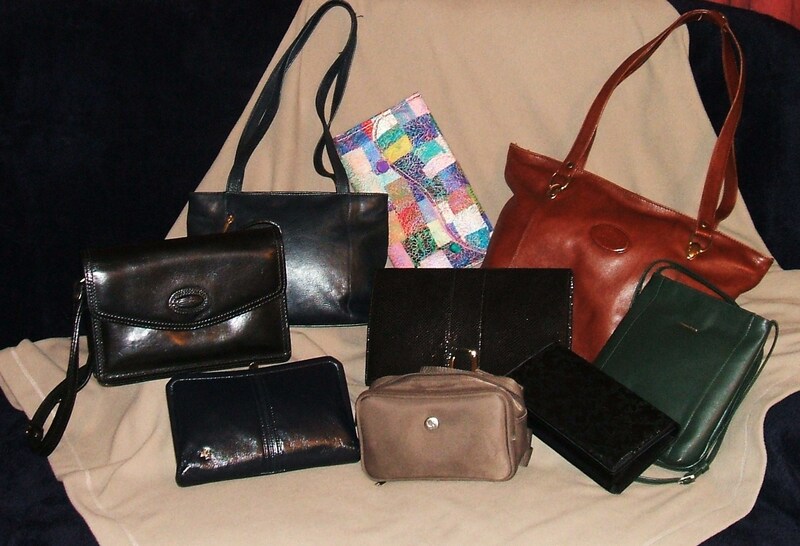 Judy – In my mother’s latter years, some of her contemporaries were mugged and their handbags stolen. It frightened mammy; so she made a habit of going out sans bag and wearing only one glove, her money was tucked into the palm of her hand inside that glove. She gave up buying handbags and if needed, she borrowed one of mine! LOL GM I thought I was the original bag lady! But funnilly enough I couldn’t pack one coming to TO this time around as I had my laptop in my knapsack and my overnighter with me on board plane. I had to actually borrow one from the grandgirl who has inherited her grandmother’s fetish with what we call the Sac Du Jour addiction….haha. Your bags are delicious, if forced to choose I would be hard pressed. I want them all…. *LOL* It makes me laugh that you bought TWO! I’d have done that as well of course. I’m not a bag or shoe person at all. I can’t be bothered transferring cards, money, lippy etc from one to another. I have a little black one like your green bag for going out, a leather back pack for every day (lots of pockets) and a camera bag! I fancy the big tan one though! They’ve definitely come back into fashion. As a male I have to confess to enjoying good shoes…. always buy the best you can afford. If I ever win the lottery I will have shoes made to measure!!!!! and new socks every day! I also keep a good look out in the local antique emporia for good handbags for Lady Magpie…hats too! Nancy…re para 3: what a girl you are… where do you put your house keys tho’? My mom gave me some of her handbags and matching shoes. They were 20 plus years old. I like handbags as well. I’m trying to remember when shoes had those tiny nail heels. The tap was about the size of your little finger’s nail. I can’t believe we walked around in those shoes! She even gave me one of her patent leather bags. How often do you see patent leather bags? I have a shelf full of bags of different colors. Now I always carry the ‘save your back’ bag no matter what I am wearing. I know I should give those others away, but I keep thinking I will use them someday. Handbags are wonderfully fun to collect, and I seem to get a great many given to me. But I always end up just using a few basic ones, so the rest are given to the charity second hand shop. Magpie, being a Brit, do you carry a shoulder bag????? Helen – I seem to find the best bargains when I am not looking for them. Baino – The only problem with the tan bag is that it is a large well with only a small inside zip pocket. Everything falls to the bottom. Magpie – I do like good shoes, but am glad to have found Sketchers for casual wear. Judy – I always loved patent leather bags and shoes. Darlene – It is always difficult to give the bags away. Brighid – Do you think we should have a bag swop? GM: I have a few wild western ones that might be a bit of a pick-me-up. And one just might have a small emergency flask tucked in it. Let me know if your interested. I see my purse habits reflected in several comments. I love good purses of all colors in very soft leather, please. Due to the fact that a few years ago I quit carrying one around habitually and consequently when I did carry one I’d forget it sometimes. Once in an airport lounge, once in a fast food place, you get the idea. So I decided to get something small–like Nancy described–that I could wear shopping and that way not worry about leaving it someplace. I still have several nice bags though, even though I don’t know when I’ll ever go someplace where a red purse won’t look out of place. I’ll let me survivors donate them to a worthy cause someday, by then they’re sure to be collector’s items. (I should learn to read over what I wrote before I submit it! By wearing it, I mean crossed across my shoulder so it won’t slip off. It will hold a camera, keys, a bit of money and an assortment of credit cards and insurance cards that could be needed, etc. ) leaving my hands completely free. Alice – Bags seem to be a weakness for so many women and our bags all tell a story.